Founded in 1850 on the banks of KwaZulu-Natal’s Klip River, this town was named after the Spanish wife of Sir Harry Smith. 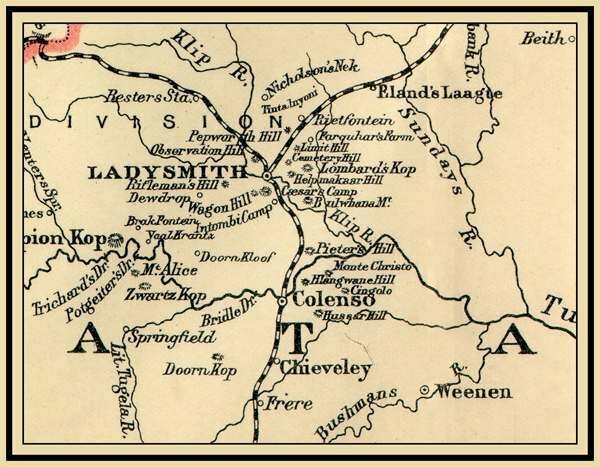 A prosperous and bustling town, Ladysmith became a popular trading post for prospectors and fortune-hunters en route to the gold- fields of the Transvaal and diamond rush at Kimberley. In October 1899, following the outbreak of hostilities between the Boer republics and Great Britain, the then Colony of Natal could no longer be a mere bystander. Volunteer Militia consisting of the A battery of the Natal Field Artillery, the Border Mounted Rifles, the Natal Carbineers and the Natal Mounted Rifles were all deployed to Ladysmith to prevent a feared Boer drive to capture Durban. Seen as a very real threat, orders were given to dispatch a further 10 000 troops from India and Britain’s Mediterranean bases to further bolster the forces stationed here and at other parts of the Colony. World headlines were made when the seige of Ladysmith began on 2nd November 1899 with the Boers cutting railway and telegraph lines, effectively trapping the British forces for 118 days. The military and civilian population numbered 21 156 and they were to suffer the ravages of disease and starvation on an unprecedented scale, and it was only on the arrival of a small force of Colonial cavalry led by Buller that relief was finally brought to the town. With this rich historic heritage as its main claim to fame, there are many fascinating sites to discover in Ladysmith. Located almost halfway between Johannesburg and Durban, this is the ideal place for a stop-over for a few hours or longer offering a rewarding experience.